ArcFlash Labs, a small startup company founded by David Wirth and Jason Murray, announced last Sunday night that their 3D-printed coil gun was available for purchase. Dubbed, the EMG-01A, the polymer-framed weapon uses a series of electromagnetic coils to magnetically accelerate, and propel a projectile. In a video released two days ago, Mr. Wirth explains that the EMG is, “an eight-stage, linear accelerator powered by a 6S LiPo battery, and features nearly a half farad of capacitance.” For most firearms enthusiasts, these terms are meaningless. In a nutshell, the EMG uses a semi-common, high-powered battery to power eight electromagnetic coils that kick on as the magnetic projectile passes by. The concept is similar to that of a rail gun like the massive test gun in Virginia, capable of launching multiple salvos at six times the speed of sound, out to 100 nautical miles. Unlike the enormous rail gun, the EGM-01A isn’t the size of an office building, and has only a fraction of a fraction of its kinetic power. But the EGM-01A seems more like a functional proof of concept, than a combat-ready weapon. Also, since the EGM is a coil gun and not a rail gun, it doesn’t use a pair of linear magnetic rails, but sequential coils to launch projectiles. The different is more academic than practical, but is noteworthy nonetheless. Despite using cutting edge tech, some components of the design should be very familiar to shooters. For example, the detachable nine-round magazine appears to be based on a hybrid of a Glock magazine, and a power drill battery pack. But what about performance? Is the EGM-01 the beginning of the end for gunpowder, lead and steel? Not likely – At least not yet. While the concept is brilliant and clearly holds merit, it needs to be substantially miniaturized and made more powerful to be a viable alternative to gunpowder. In the demonstration video, the creators fire the EGM-01 at a number of different targets including soda cans, 20 gauge steel and some glass bottles. While the gun appears to easily destroy the cans and bottles, it occasionally struggles to pierce the non-hardened, 0.0375 inch-thick steel. This is because despite firing a decently hefty 71gr steel dowel, the EGM only propels it to 147 feet per second. 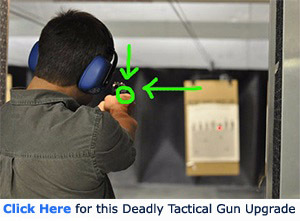 Compare that to a Ruger MKIV firing a 40gr lead .22lr at 1,050 FPS and you begin to understand the power gap. Still, if the creators find a way to bump the muzzle velocity up 200% they’ll quickly be approaching airgun values. Which means the next iteration of the EGM could be an effective small game hunting tool with the proper ammunition. Personally, I would like to have seen how much velocity ArcFlash could produce from a much smaller, lighter projectile with the same amperage and power. Because if varmint calibers have taught us anything, small, light and blistering speed are a deadly combination. As for plasma rifles and laser blasters, we’ll have to wait a few more decades for those. Purely a technology demonstration — not only does it lack the velocity to be even a ‘range toy’ the larger problem is that it has no way to stabilize the projectiles. Electromagnetic “guns” have the inherent limitation that they cannot provide the spin created by the rifling of conventional firearms. Because the projectiles CANNOT be spin-stabilized they have to rely on some form of aerodynamic stabilization (such as fins). Since this “gun” is designed to use short sections of common steel dowels, the projectiles begin to tumble immediately upon being launched (which probably accounts for the differences in penetration against the thin steel plate). You would get the same performance by launching the same dowels from an ordinary slingshot — in fact you would get BETTER performance since a common modern slingshot achieves higher velocities. I have no doubt that both these gentlemen are fine engineers, but if they have any serious thoughts about making a viable “gun” they need to bring in another partner who understands ballistics. Bottom line: they need to be launching something more like a crossbow bolt rather than like a bullet. Rotation could be achieved if the push wasn’t in a straight line, to bad I am medically retired, while I was in the Navy I helped Gruman Engineer’s with showing them a small modification on some equipment enhanced performance. a polymer bolt with ferrous inserts arranged perhaps in a spiral pattern could impart spin and increased velocity. hmm, where’s my patent attorney ? This is an interesting project though they need to find some way of adding rifling to the barrel in a way it could be applied to the projectile to add the spin needed to stabilize the projectile and use more common smaller caliber projectiles. as suggested above a polymer coating and some form of rifling added to the barrel/tube they launch down could achieve this. My guess is that in this technology demo they wanted to show it was possible to make a hand held version that was capable of semi auto fire as the past units I have seen were single shot and took time to charge the capacitor bank this rendered them useless as an actual defensive weapon and as nothing more than a glorified dart gun showed little practical use. This demo on the other hand shows one that is capable with some refinement of being similar to other small arms. As for the speed of the projectile I thought I read somewhere years ago the government passed some kind of muzzle velocity restriction on coil guns after home made variations began popping up on YouTube.